The John Paul II Centre is offering an exceptional venue and service for meetings, conferences, regular and one-off events, as well as corporate and social functions, the John Paul II Centre is ideal whatever your occasion or need. 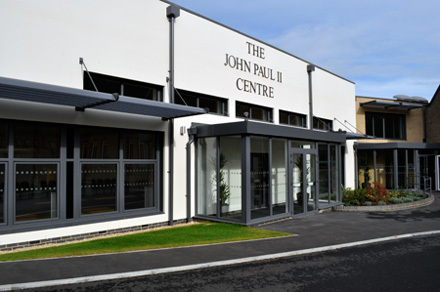 Situated in the town of Bicester, Oxfordshire, the John Paul II Centre is within easy reach of London, Birmingham or Oxford by road or fast rail links. The Centre offers state of the art audio/visual facilities in its two main conference halls. As the largest passivhaus construction currently in the UK, the Centre ensures ultra-low energy usage and a very small carbon footprint. Through the effective use of natural light, advanced window technology and airtight insulation, the Centre uniquely combines intimacy with spaciousness – all year round. Officially opened by HRH The Princess Royal on 1st November 2011. We recoginse every event, party, wedding, conference is different. We understand your need to make your event a special one. Whatever the occasion, give us a call, we will do all we can to help you. "We were delighted with our event and had a very pleasant evening. Thanks to all your staff who were very welcoming and helpful."